Track and field, he said, is “helping to shape” the International Olympic Committee’s “Agenda 2020” potential reform project. At the same time, he made clear, track “is the soul” of the Games and while new sports “may be coming and so on, athletics,” using the word in wide use outside the United States for track and field, is not just the soul but also “the heart” of the Games. In all, Diack's remarks marked the sort of valedictory one might have expected come next August in Beijing, upon the occasion of both the 2015 world championships, when the vote to succeed him will take place. The vote is Aug. 19; the meet itself runs Aug. 22-30. Britain’s Sebastian Coe and Ukraine’s Sergey Bubka are expected to vie for the presidency. Neither has publicly declared. Diack’s comments Friday turned into a reminder of how track and field’s leaders see the sport as the undisputed No. 1 Olympic event, combined with a pointed political rejoinder — conflated with the selection of both Adams and Lavillenie — of the import not just of track but of field as well, and of two marquee athletes widely believed to be doping-free. In a year in which the U.S. sprinter Justin Gatlin — who has been busted twice for doping — dominated the sprints and was included in the initial nominations for athlete of the year, which caused considerable controversy within track circles, Adams and Lavillenie stand, for many, as portraits of The Anti-Gatlin. Adams becomes the first female thrower to win athlete of the year, Lavillenie the first male pole vaulter. Not even Bubka won the award, which was established in 1988. Beyond the drama sparked by someone like Gatlin, a year like 2014 makes for an intriguing set piece for end-of-year awards. Usain Bolt did not run, or at least much. There were no outdoor world championships and no Olympic Games. Different athletes, from wherever in the world, can find themselves working on different things — witness decathlon champion Ashton Eaton’s foray into the 400-meter hurdles. Lavillenie, in mid-February, jumping in Donetsk, Ukraine, before an audience that included Bubka, broke Bubka’s 21-year-old world-record in the vault. The old mark: 6.15 meters, 20 feet-2 1/4 inches. The new: 6.16, 20-2 1/2. Lavillenie is of course the 2012 Olympic champion. He had only one blemish on his 2014 season — he no-heighted at the Diamond League meet in Stockholm, meaning he lost in but one of 22 outings. "This," he said, "is not bad." Adams is, right now, like the U.S. baseball star Joe DiMaggio. She has not lost in 56 straight meets. Over the past two years, she has undergone four surgeries. She came to Monaco nursing the effects of work on a shoulder and an elbow, looking out not just toward 2015 but to Rio and the 2016 Olympics and the 2018 Commonwealth Games in Australia. Adams has long been an outspoken advocate for competing clean, and in an event marked by notorious episodes of doping. She has two Olympic golds, in 2008 and 2012; four outdoor world titles; and three world indoor golds. As an example: one of her many brothers, Steven, was a 2013 first-round draft pick by the Oklahoma City Thunder; he is currently averaging 8.1 points and 6.8 rebounds per game. Make no mistake: a focus of the IOC’s Agenda 2020 plan is a shift in the Olympic program from sports to events. The idea is to try to get new events in such as surfing, skateboarding, climbing. To do that, though, while keeping within the IOC’s self-proclaimed cap of 10,500 athletes is going to mean that cuts are going to have to come from somewhere, and that means track and field is going to be approached. Race walking? For all those who consider it goofy: look at the diverse range of countries that have won medals or competed for real in just the past few editions of the Games, especially in the women's events; isn't the IOC purportedly big on universality? Was it mere coincidence that among the IAAF's Hall of Fame inductees Friday was the Polish race-walking star Robert Korzeniowski, winner of four Olympic gold medals and, at the world championships, three golds and a bronze? Hammer throw? What about tradition and history? In the Summer Games since 1900? What about IOC activist Koji Murofushi of Japan, the 2004 Athens gold medalist? Shot put? Especially the women’s shot? Adams is in every regard a deserving IAAF athlete of the year winner in 2014. She was nominated for the same award in 2013, when the Jamaican sprinter Shelly-Ann Fraser-Pryce prevailed. 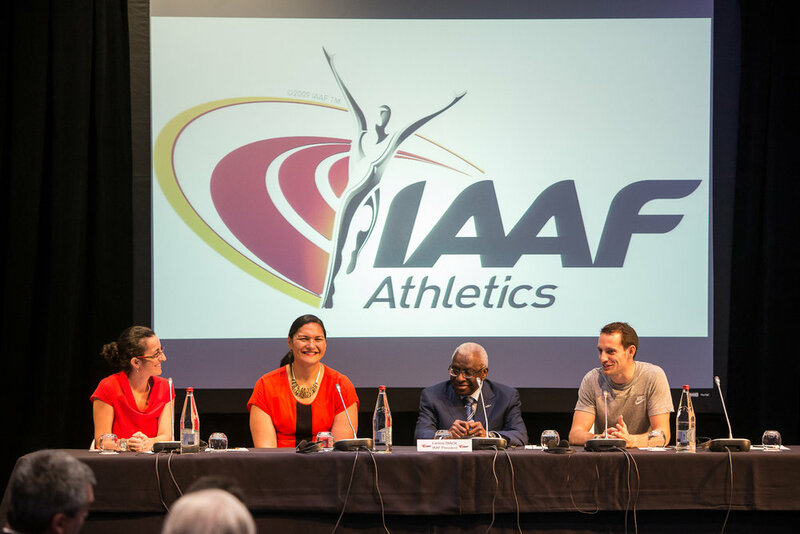 Again, looking toward the IOC’s vote on Agenda 2020 back here in Monaco in just two weeks, what -- if anything -- is to be read into the selection of Valerie Adams as your 2014 IAAF female athlete of the year? Diack may be 81 but many over the years have foundered in underestimating his political skill and resolve. Just moments before, he had said, “I always knew there were many challenges and many things to do. “I am happy to say that I still have nine months to go. In the past I was counting years. Now I am even counting days. I soon will be transmitting my stick to somebody who will be able to carry it even better than me. This evening’s gala,” referring to the formal announcement of the winners, “must be beautiful for all those who love our sport. It is, Adam Nelson said Wednesday, bittersweet. It has been more than eight years since they held the shot put competition at the Athens Games, and on Wednesday the International Olympic Committee announced that the winner, Ukraine's Yuriy Bilonog, was now disqualified. Nelson was the 2004 silver medalist. Now he stands to be moved up to gold. Bilonog's doping sample was among those re-tested earlier this year, the IOC said, and found positive -- along with three others -- for steroids. A fifth case remains pending. That's good, of course, because the IOC has done the right thing by Nelson and all athletes who compete cleanly. But it took eight years-plus to get there. That raises fundamental questions about whether justice delayed is justice denied. If Nelson, already a silver medalist in Sydney in 2000, had been a gold medalist in Athens in 2004 for all these years, too, maybe he would have enjoyed considerably more marketing opportunity. Stands to reason, right? Meanwhile, the circumstances of the Bilonog case -- and the three others, also field athletes, as in track and field -- underscore an essential, and ongoing, truth about Olympic sport. Doping remains a scourge that strikes at the very core of track and field. Other sports, too, in particular cycling and weightlifting. The 2004 Athens Olympics yielded a record haul of doping cases. The new tests lift the number to 31. Eleven of those 31 were medal winners. Three of those 11 were gold medalists. Meanwhile, the IOC on Wednesday put off any decision in the case of Lance Armstrong's bronze medal from the Sydney 2000 road time trial. It said it needs cycling's governing body, UCI, to formally notify Armstrong first that he has been disqualified in Sydney amid the extensive report from the U.S. Anti-Doping Agency that detailed Armstrong's doping and prompted the loss of his seven Tour de France titles from 1999-2005. In the 2004 cases, the matter of weightlifter Oleg Perepechenov of Russia remains under study. Barring an unusual turn, the other four cases would now appear to be settled. And it is abundantly obvious -- and has to be pointed out -- that all five involve athletes from Russia or countries of the former Soviet Union. Two of the other four are women: discus thrower Irina Yatchenko of Belarus and shot putter Svetlana Krivelyova of Russia, both bronze medalists. Krivelyova is also the 1992 gold medalist in the event. The other two: hammer throw silver medalist Ivan Tsikhan of Belarus and the Ukrainian Bilonog. In the United States, we have assuredly endured our doping scandals -- the Armstrong matter, most recently, and before that, the BALCO matter. But so -- at least in Olympic sport -- is USADA's effort to level the playing field. Can the same be said elsewhere? With conviction? "This particular episode reveals something athletes have known for a long time," Nelson said, explaining a moment later, ""There are more compliant sports and more compliant athletes," meaning compliant with best-practices doping protocols. "This, to me, is a disgrace on multiple levels. And it's something that could be avoided if more Olympic sports or organizations would adopt the policies we follow in our country." The shot put was one of the capstone events of those 2004 Games, held not in Athens but on the grounds at Olympia, where the ancient Games began in 776 B.C. ; the 2004 event marked the first time women threw on the field. The women's winner in 2004, Russia's Irina Korzhanenko -- who threw the shot 21.06 meters, or 69 feet, 1 inch -- tested positive afterward for the steroid stanozolol. That's the same steroid Ben Johnson tested positive for at the Seoul Olympics in 1988. As David Wallechinsky notes in his authoritative history of the Olympic Games, this marked Korzhanenko's second doping ban. Her first came at the 1999 world indoor championships, which cost her a silver medal and kept her from the 2000 Sydney Games. 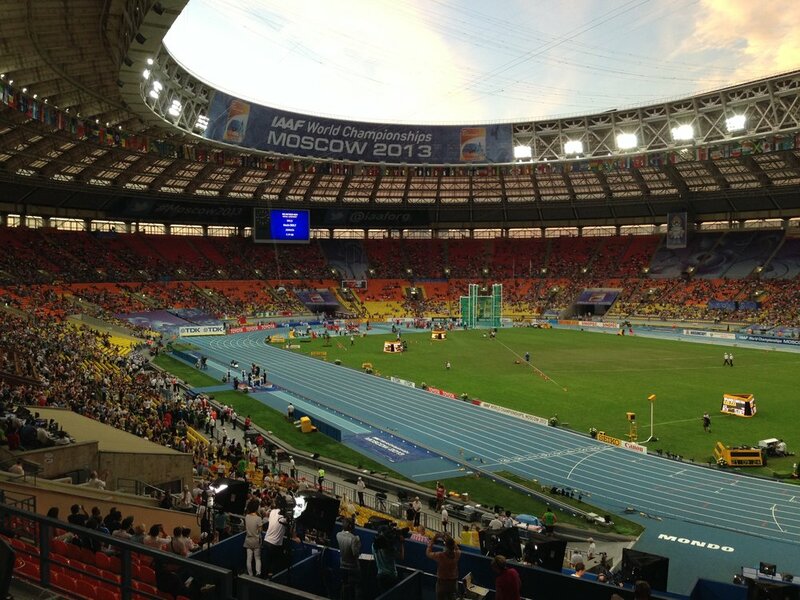 Facing a lifetime ban because of the second positive test, Korzhanenko not only refused to give back the medal but was named a coach for the Russian track and field team, Wallechinsky writes. Again, the third-place winner, Krivelyova, was busted Wednesday. The fourth-place 2004 finisher, Nadezhda Ostapchuk of Belarus, the 2005 world champ, won the shot put at the London 2012 Games. Shortly after becoming Olympic champion, she tested positive for the steroid metenolone. Valerie Adams of New Zealand, the 2008 Beijing winner, was upgraded from London silver to gold. On the men's side in Olympia in 2004, Nelson took the lead on his first throw, 21.16, or 69-5 1/4. Then, though, he fouled on each of his next four tries. Through five rounds, Bilonog remained one centimeter, 21.15, behind. On his sixth and final throw, Bilonog matched Nelson, going 21.16, 69-5 1/4. The rules: ties to be broken by comparing each athlete's second-best throw. Through five rounds, Nelson had no second-best throw. He had only those four fouls. On his sixth try, Nelson threw 21.30. But it, too, was ruled a foul. Nelson protested -- but video showed Nelson had, indeed, fouled. Bilonog was declared the winner, the first time in Olympic history a gold medal had been awarded on the basis of a second-best mark. Bilonog's doping samples, re-tested in 2012, at the World Anti-Doping Agency-accredited laboratory in Lausanne, Switzerland, turned up evidence of the steroid oxandrolone. The IOC was informed July 13 of the positive test on Bilonog's A sample; his B sample was split into two parts; those samples turned up positive as well in tests done Nov. 1 and 2. In Europe, according to no less an expert than Victor Conte, the figure at the center of the BALCO affair, the steroid goes by the name "Annavar." Here in the States. it is known as "Oxandrin." Conte would know. When he was himself arrested, agents found 269 Oxandrin pills, in three square-shaped bottles, in his storage locker. Each pill, 2.5 milligrams, is shaped like a little football. You take "quite a few at a time, for toning purposes," men as many as 20 a day, Conte said. Oxandrin is hardly a newly discovered steroid. The obvious question: how did Bilonog get away with it in 2004 only to be found out now? Since the IOC and WADA are not giving away secrets, it's speculation. But the ready answer would seem to be along the lines of how Johnson was caught in 1988 -- testers probably inventing a technique for being able to measure at lower concentration than before. "That would be my gut response to you," Conte said, adding a moment later, "What they couldn't see and couldn't detect in 2004 they can now." It takes time for steroids to clear out of one's system. That's called "tapering." If you were an athlete or coach, and knew it took, say, 14 days for a certain steroid to wash out instead of 10 because of the sensitivity of the testing instrument, you'd plan accordingly. But if you didn't know how many days were at issue, or if that number changed years after you'd already implemented your plan, then -- like Yuri Bilonog -- you would suddenly find yourself a gold medalist no longer. "I would be thrilled if they would award me the gold medal," Adam Nelson said. There wouldn't be the thrill of standing atop the podium at ancient Olympia. Even so, he said quietly, "I would have some small celebration." DAEGU, South Korea -- Sure, technique helps. Right, being healthy is huge. But when you're in love, really truly madly in love, the kind of love they write about in books and they make movies about, when your husband is your soulmate, and you're out there in front of the cheering thousands, and you've got to will yourself to go places you've never gone before, he's there with you. It's true love. It is. That's the kind of love that Jillian Camarena-Williams and her husband, Dustin, have, and it's why she won a bronze medal in the shot put Monday night at the 2011 track and field world championships with a throw of 20.02 meters, or 65 feet, 8 1/4 inches -- the first medal of any kind for an American woman in the history of the track worlds. It's love, and if it seems improbable that love is the reason why Jillian did something no American had ever done before, it's not improbable to Jillian, to Dustin or to her coach, Craig Carter. Because when she was asked, an American flag draped around her, to explain how she had just made history, she said, with zero hesitation, "I married that man over there and I have that man over there as my coach." It's almost as if fate has been pointing Jillian and Dustin toward this moment -- and, you'd have to suggest, London next year. They met at the 2008 U.S. Olympic Trials, where she was competing and he was an athletic trainer. She went on to the Games, finishing 12th. When she came back, she moved up to Utah, where he was based, to finish a master's degree. They were friends first, then more. They were married in September, 2009. She throws a big heavy ball. He runs Ironman-style competitions. To be around them is to feel that sense of union and balance you meet in precious few couples. You know it intuitively when you meet such a couple. They have it. These last two seasons have been breakthroughs. Coincidence? Last September, in Zurich, she finished third, throwing 19.5, or 63-11 3/4. This June in Eugene, she threw 19.76, or 64-10, the best American throw since Ramona Pagel's American record of 20.18, or 66-2 1/2, in San Diego in June 1988. This summer, competing regularly on the Diamond League circuit, she finished in the top three four times, saying Monday at a late-night news conference that being in the show regularly gave her the confidence to not just think but know that she absolutely belonged in the ring with the other top women in the world. In Paris on July 8, she equaled Pagel's American record -- 20.18. Here Monday evening, she threw 19.63, or 64-5, in the first round. That put her into the lead, though she -- and everyone else -- knew it wouldn't last, not with New Zealand's Valerie Adams and Nadzeya Ostapchuk, among others, around. Her next two throws were considerably shorter. She said later she was just going too fast. In Round 3, meanwhile, Adams went 20.04. In Round 4, calmer, Jillian threw 20.02, the second-best effort of her career. That launched her into second place. In that same round, Adams went 20.72. The gold would be hers unless someone came up with something extraordinary. In Round 5, Ostapchuk heaved the ball 20.05. That put her into second, Jillian into third. Jillian's final two throws: 18.8 and 19.44. The exclamation point: In Round 6, Adams went 21.24, or 69-8 1/4, the longest throw outdoors in 11 years, an area record, a personal best and, for good measure the widest winning margin (by 1.19 meters) in the history of the event at the world championships. As well, the gold was Adams' third in a row at the world championships; she won bronze in Helsinki in 2005. The previous best American effort, meanwhile, came from Connie Price-Smith, who finished fifth in 1997, with a throw of 19.00. Here in Daegu, Connie is the American women's head coach. After Jillian had finished posing for photos and talking to a couple reporters, she walked right over to Connie; they exchanged a knowing glance and then hugged each other, and it was hard to tell who was happier. When they get back to the States, Jillian and Dustin are going to be moving from Utah down to Tucson, to work with Craig, at the University of Arizona. "Now that she found him," Craig said, pointing to Dustin, "we had to find him a job!" Then he said, seriously, mindful that the London Games are 11 months away, and that no one can tear asunder what it is that Dustin and Jillian have together, "If we keep her healthy, a lot of good things will happen."